Art Jewelry Forum is pleased to share the news that members in our community find noteworthy. Providing a place to share interesting news is one way AJF is celebrating our 20th anniversary. We believe our members and donors, as dedicated jewelry aficionados, have a unique outlook on the world, and the monthly report is a place to relate news, opportunities, events, and articles. Is something missing? The success of this compilation of compelling events, exhibitions, and items of interest to the jewelry community depends on YOUR participation. If you’re a member or a donor to AJF, you can add news and ideas to the monthly report by going to artjewelryforum.org/news. If you aren't a member or a donor but would like to become one, go to artjewelryforum.org/donate. We’d love for you to join our community! With a strong foundation for long-term growth and continued relevancy in place, Amundsen feels that the Council is in an excellent position to recruit a new leader to guide the organization. Stuart Kestenbaum says the board of trustees will appoint a committee to begin the search for a new executive director. The Baltimore Jewelry Center (BJC), is building a vibrant creative community for new and established metal and jewelry artists. As an educational 501(c)(3) nonprofit, they’re on a mission to educate and inspire Baltimore and beyond through their programming, exhibitions, and community and educational outreach. The BJC aims to reconnect Baltimore to its rich history of metalsmithing and jewelry, and increase awareness of contemporary metalsmithing and jewelry as an art form. Their shared values guide them in building an environment where metalsmiths and art jewelers innovate and elevate each other through collaboration. Different perspectives, openness, and respect enrich our community. Together, they’re empowering metalsmiths and art jewelers to evolve the field through study, practice, and leadership. The BJC seeks a Studio Manager who is passionate about metalsmithing and art jewelry and loves engaging with people in a variety of settings, from the studio to community events, conferences, and more. As administrators focused on the programming and management of the BJC, studio managers are a primary representative of the BJC for the community and have a big impact. For more information, contact Shane Prada. In February 2017, Professor Kadri Mälk was decorated with the Order of Honour by the president of Estonia for her jewelry. Over the years, the Order has been awarded to several artists, but never to a jewelry artist. 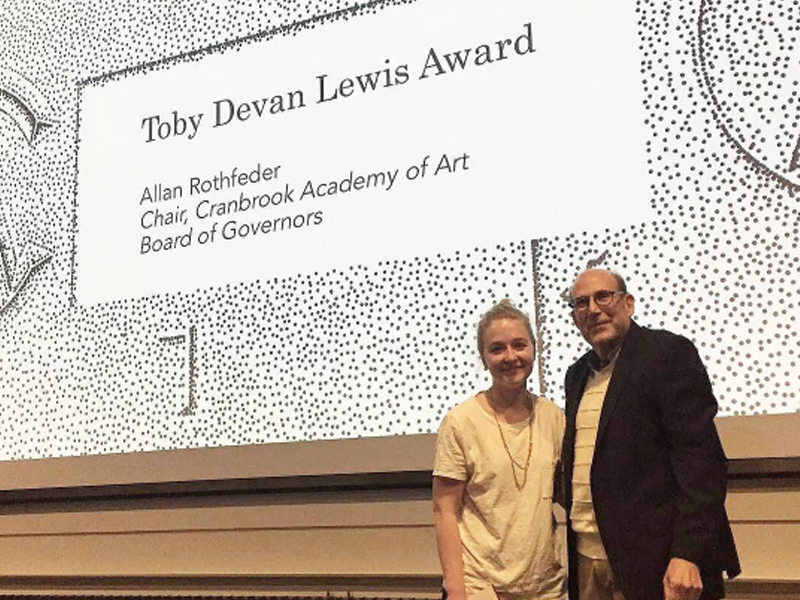 Emily Culver, a former AJF intern and a 2017 graduate of the metalsmithing department at Cranbrook Academy of Art, was awarded the $10,000 Toby Devan Lewis Fellowship. This award was created by the philanthropist, art collector, author, and curator Toby Devan Lewis, who has been an avid supporter of young and emerging artists. She created The Toby Fund to give graduating fine arts students at more than 15 schools of art around the country unrestricted grants with which to begin their careers. Upon graduating, Culver will be an artist in residence at Arrowmont School of Arts and Crafts for the 2017–2018 calendar year. The Australia Council for the Arts has recognized renowned designer, jeweler, and curator Susan Cohn with an Australian Council Award for her significant contribution to the cultural and artistic fabric of the nation, along with seven other outstanding artists in the areas of music, literature, community arts and cultural development, emerging and experimental arts, visual arts, theatre, and dance. Cohn’s work has been extensively collected by the Museum of Applied Arts and Sciences. She established her studio, “Workshop 3000,” in 1980 with Marian Hosking and Harry Rowlands. The studio also offered traineeships to emerging jewelers and metalsmiths during an era of intense creativity. Cohn has long been recognized as one of Australia’s innovative, influential, and well-respected jewelers, metalworkers, and designers. Her practice has always been inventive and sophisticated, often engaging conceptual aesthetics to push and challenge the boundaries of traditional jewelry-making and design. Her practice has contributed to the dialogue of jewelry-making not just in Australia but across the globe. Donald Friedlich was recognized for 30 years of dedicated volunteer service during the SNAG conference in New Orleans, Louisiana with a fantastic speech by Kristin Beeler. Both Don and Kristin are AJF members as well as members of SNAG and it is heartening to see the dedication and involvement of individuals in the broad field of jewelry--we are all better for it. In Kristin's words, "Don’s service re-defines ‘excellent’. It’s not just impressive. It’s unprecedented. [H]is insight, clarity and his fidelity are an invitation to us all to give ourselves more completely, more wisely, more devotedly." Congratuations to Donald--you are an inspiration to us all. In April 2017, Hauser & Wirth debuted its Portable Art Project in New York with an exhibition of wearable objects commissioned from 15 artists—works that exist somewhere between sculpture and bodily adornment. Organized by Celia Forner, who collaborated closely with the artists, the Portable Art Project includes unique pieces as well as editioned series, crafted from an array of materials ranging from traditional gold and silver with precious and semiprecious gems to enamel, aluminum, bronze, and iron. The initiative began with an invitation to Louise Bourgeois, who in 2008 conceived different spiral-like precious metal cuffs. In the years since Bourgeois designed these first contributions, the Portable Art Project has evolved to include John Baldessari, Phyllida Barlow, Stefan Brüggemann, Subodh Gupta, Mary Heilmann, Andy Hope 1930, Cristina Iglesias, Matthew Day Jackson, Bharti Kher, Nate Lowman, Paul McCarthy, Caro Niederer, Michele Oka Doner, and Pipilotti Rist. The Journal of Jewellery Research (JJR) is the first peer-reviewed online and open-access publication that focuses on the design, theory, and praxis of jewelry studies. It currently has an open call for full papers, with a submission deadline of June 30, 2017. The journal promotes jewelry research into materials, techniques, technologies, methodologies, processes, concepts, and aesthetics. It provides an interdisciplinary arena for the discussion and analysis of jewelry. This spans conceptual, practical, pedagogical, and cultural contexts across both contemporary and historical timeframes and at the intersections between jewelry and other disciplines. JJR aims to publish original papers that have demonstrable research and a clear contribution to existing knowledge—to this end it fosters submissions from practitioners, researchers, theorists, curators, and historians. JJR publishes original papers in two forms of academic paper: conventional and visual/textual. Please see descriptions of each form, formatting requirements, and contact information on the official website. The Dutch initiative Mothers in Arts supports women artists who are also mothers, and shines a light on the mother-shaped blind spot within the art world. It puts forward a discussion about a problem that affects many young female artists when they become parents. Even though many artists have children, parenthood—especially motherhood—remains stigmatized in the art world. Therefore, besides the physical and mental challenges of childbearing, an added feeling of isolation can be felt by many mothers. Visit the link for a residency, current artists, and resources. An exhibition of the artists will be shown in June 2017. Perhaps the next round can include a jewelry artist—there are a lot of working mothers in our community. Take a look at a recent segment of Articulate, an Emmy® award-winning arts and culture show nationally syndicated on PBS, profiling jeweler Bruce Metcalf. The low-key Providence Jewelry Museum is undergoing an expansion, rechristening itself the National Jewelry Museum and opening to the general public. New plans call for it to expand from 5,000 square feet to 6,000, move to Providence’s jewelry district, and open full-time to the public. Museum president Edward Lemire says that it also hopes to attract sponsorships and participation from some big jewelry names still connected to Rhode Island, such as Tiffany and Swarovski, as well as newcomers like Alex and Ani.